James Ralph was an 18th-century content creator, scratching out a living in England’s New Economy. In an age of political, social and technological upheaval, life could be precarious for those who kept the printing presses stoked with words. The quote comes from The Age of Authors: An Anthology of Eighteenth-Century Print Culture, a remarkable collection of writing about writing and the plight of writers. Editor Paul Keen writes that Ralph was “often dismissed as a Grub Street hack writer,” but managed to produce some important work, including the essay quoted above. 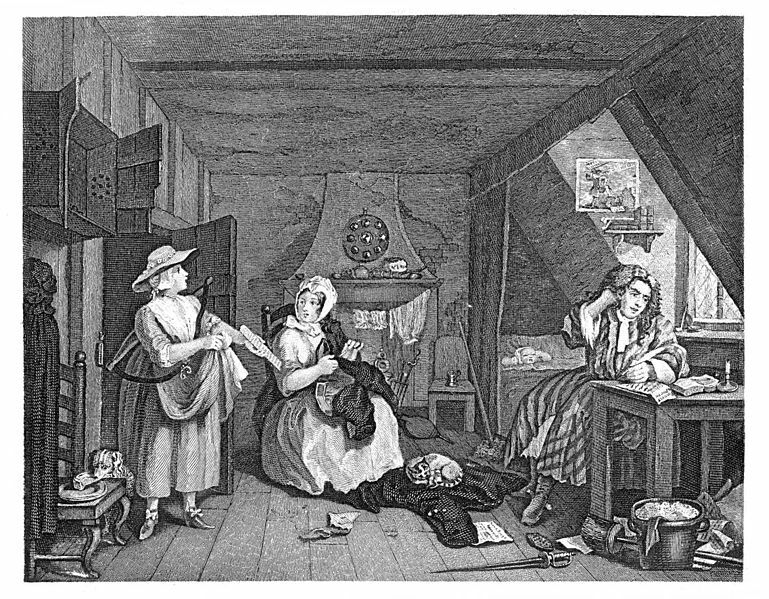 The Distrest Poet, by William Hogarth. The essay, The Case of Authors By Profession or Trade, Stated, marks the decline of the era when writers relied on patrons. The new commercial model of publishing was generating profits that were being denied to those slaves in the garrets, Ralph argued. Eighteenth-century readers suffered from their own version of information overload. Writing in the guise of a Chinese philosopher explaining England to friends at home, Oliver Goldsmith calculated that British presses churned out 8,395 new books a year, or 23 books a day. While many in the 18th century saw their era as the Age of Authors, they did not mean the term as a compliment to the times. 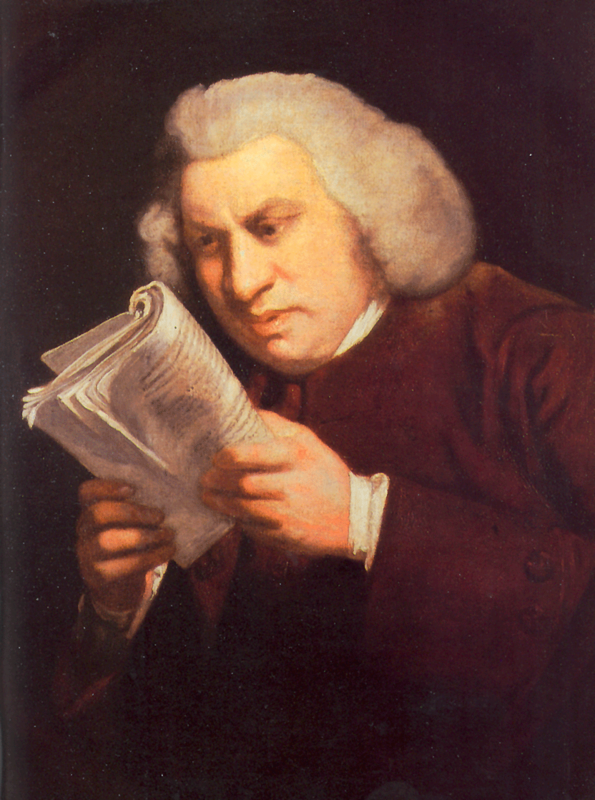 “The present age, if we consider chiefly the state of our own country, may be stiled with great propriety THE AGE OF AUTHORS; for, perhaps, there never was a time, in which men of all degrees of ability, of every kind of education, of every profession and employment, were posting with ardour so general to the press,” Samuel Johnson wrote in 1753. Samuel Johnson, by Joshua Reynolds. Among those who saw no shame in writing for money was “Mr. Town,” a pseudonym used by George Colman and Bonnell Thornton in a weekly paper known as The Connoisseur. “Even supposing an Author to support himself by the profit arising from his works, there is nothing more dishonest, scandalous, or mean in it, than an officer in the army (the politest of all professions) living on his commission.… An Author is no more to be condemned as an hackney scribbler, though he writes at the rate of so much per sheet, than a Colonel should be despised as a mercenary and a bravo, for exposing himself to be slashed, stuck, and shot at for so much per day,” Mr. Town argued. Today, in the Age of Algorithms, writers again must ask to be paid for their work. And a thousand followers on Twitter still won’t purchase a shoulder of mutton.